I’ll be making a swing through Ohio and Michigan at the end of February, doing my reading/slideshow at public libraries in Cleveland, Flint and Kalamazoo. 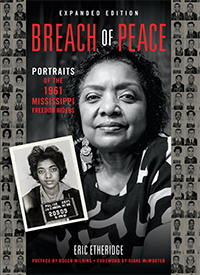 Appearing with me at all three events will be Freedom Rider Miller Green (above and below). Miller was a high school student in Jackson, MS, when he was arrested on July 6, 1961. He lives in Chicago today. If you’re nearby, please come see us. Kalamazoo Public Library is looking forward to seeing you tomorrow!